Kelly Chen had a press conference last month to hype "Reflections", an album that was released earlier this month. She also brought out a couple of music videos. All of that activity somehow slipped through our fine-meshed seine that usually nets everything concerning female artists connected to the Hong Kong and PRC movie biz, however tangentially. Anyone that is a movie or recording star (or both), no matter how talented she is and how hard she works, still must present a manufactured image to the public since we identify with performers through their roles and what they produce. When Kelly Chen works a carefully staged publicity event, acting interested in what the press are asking and sincere in her respect for them and does so with a huge image of herself looming over her it makes this even more clear; an image appearing in front of an image. Make-up for one of the music videos promoting a single that may be called "Skin Trauma". It probably made a lot more sense before going through the automatic translation word chopper. And the video itself--it goes without saying--although I will say it--that she can really move; an excellent dancer in the context of a music video. ...although Ni Ni was identified as "Ziyi Zhang" (who?) by Zimbio. Xinhua and Yahoo China had their own gaffe, calling the Film Independent Spirit Awards the "small Oscars" which they aren't although the Spirit awards are presented in Los Angeles the evening before the Academy Awards. Zimbio moves a lot of data in several languages 24 hours a day from all over the world and they have probably made more egregious errors than this one but that doesn't excuse slapping an incorrect ID on images of an actress and not even using the preferred form of the wrong name. Fan Bingbing and Li Bingbing took their teeny handbags and glam party dresses to the Vanity Fair after-Oscar bash. While realizing that the evening bags are props/ads, there is still very little room for much of anything in them--perhaps a compact for last minute touch-ups, a subway token to make sure one can get home if she has to ditch her date and a poison tipped dagger if trouble arises. For those interested, FBB's dress was from Joe's Custom Awning while LBB wore a suit from Bat-Wings R Us. 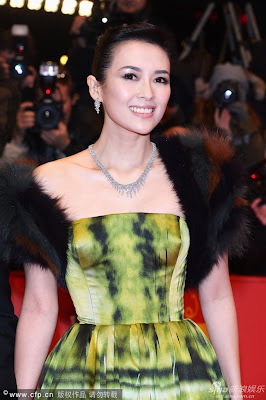 The comments from "netizens", as rendered in Googlespeak by automatic translation seemed more grumpy and grouchy than the not unusual run of mean spirited trashing, complaining that Fan Bingbing doesn't have a movie out so why was she there and that her left arm is fat (odd). 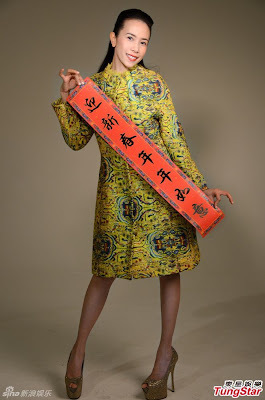 Nothing to whine about with Lin Peng--she has had a busy couple of years with six films released in various parts of the world in 2011 and 2012. Her appearance was described in the running translation as "a big show of hot body wearing a black thoracotomy dress,"a description I couldn't improve on if I tried for a year. Some pictures that must have been shot by the unit still photographer on the set of The Maidens of Heavenly Mountains. There are typical stills that might be used for publicity, shots of technicians working with--actually around--the two actresses and candid (or at least candid looking) images of them relaxing between takes while remaining in costume and makeup. 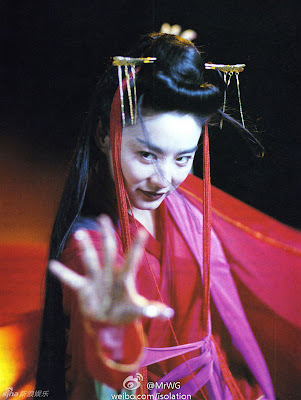 Sharla Cheung Man also starred in The Maidens of Heavenly Mountains (wearing a long white beard) but she unfortunately wasn't included in this sequence. NOTE: Blogger seems to have a new image interface (or I have stumbled upon an old one) that creates images of odd sizes and places them randomly in the post. The old way of uploading images included instructions for the size and location (right, left, center) which it now lacks. Cute as a boxful of puppies and before her career defining position as a sales clerk at Lane Crawford. Maggie Cheung returned to Hong Kong fro the UK to try her luck in the model/actress/beauty contest business. Sina dug up some shots on the sun-kissed beaches of the then Crown Colony. Karen Mok celebrates the year of the snake in a red mini dress and a green cheongsam. Her English language album "Somewhere I Belong" was released last month. 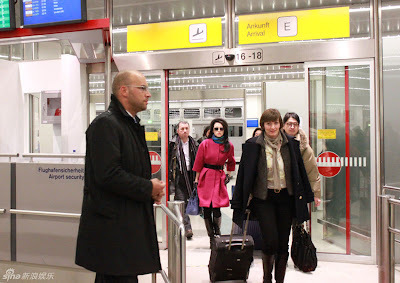 Zhang Ziyi flew in to Berlin (and were her arms ever tired!) for the big show and Xinhua has the badly focused cell phone pictures to prove it. Some functionary handed her a pot of flowers while being watched by a very Teutonic looking bodyguard/minder. The red carpet for the Berlin International Film Festival (the Berlinale) covers a lot of acreage so the stars, models and hangers-on spend a lot of time smiling and freezing in a northern European winter's evening. The faux fur on Zhang Ziyi's gown probably didn't help much but she did make a big entrance wearing bright green, an unusual choice that worked very well. 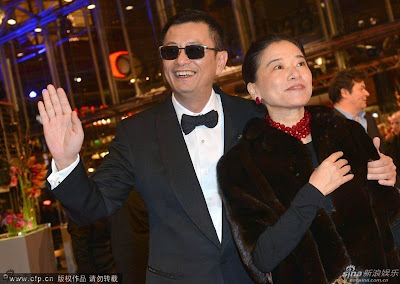 The Wong Kar-Wai film "The Grandmasters" with Zhang and Tony Leung Chiu Wai opened the festival. With relaxed and confident Tony Leung--mutual arm candy. No shortage of frenzied autograph seekers, cell phone camera wielders and, from the looks of the equipment, a few professional members of the press--or at least paparazzi with nice cameras. There are a few maniacal looking types in the scrum. Wong Kar-Wai, shown here with his wife Esther Wong, is the chairman of the jury for the Berlinale this year as well as having his film open the festival. They seem to like him in Berlin.